Growing public & private infrastructures, surging industrial, commercial, retail and hospitality sectors have increased the energy demand throughout the globe. To meet this demand, gensets are readily getting deployed to provide prime, standby and peak shave power across various sectors. In terms of power rating, the market is dominated by the 300.1-1000 kW segment in 2015 followed by the 60.1-300 kW segment. The major companies in global gas genset market include- Caterpillar, Cummins, GE, Dresser-Rand, Generac, Himoinsa, Wartsila, MTU and others. The report thoroughly covers the gas genset market by KW ratings, verticals, applications, and countries. The report provides the unbiased and detailed analysis of the on-going trends, opportunities/high growth areas, market drivers, which would help the stakeholders to decide and align their market strategies according to the current and future market dynamics. • Historical data of Global Gas Genset Market Revenues for the Period 2010-2015. 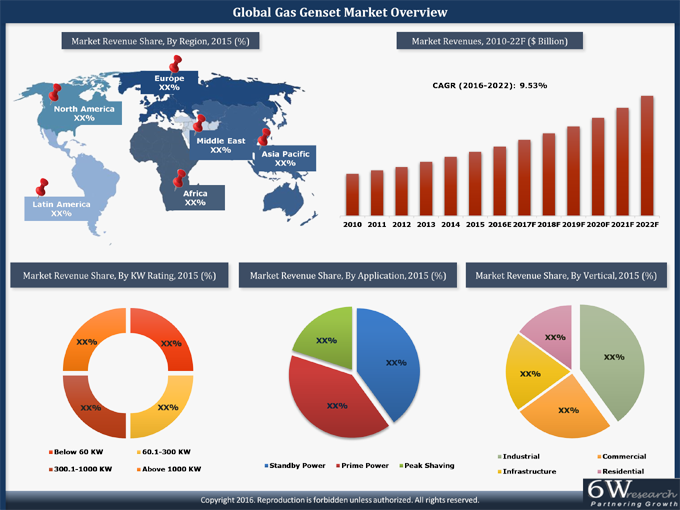 •	Market Size & Forecast of Global Gas Genset Market Revenues for the Period until 2022. •	Historical data of Global Gas Genset Market Volume for the Period 2010-2015. •	Market Size & Forecast of Global Gas Genset Market Volume for the Period until 2022. •	Market Size & Forecast of Global Gas Genset Market by KW Rating until 2022. •	Market Size & Forecast of Global Gas Genset Market by Application until 2022. •	Market Size & Forecast of Global Gas Genset Market by Vertical until 2022. •	Market Size & Forecast of Global Gas Genset Market by Region until 2022. •	Market Size & Forecast of Global Gas Genset Market by Country until 2022. Global gas genset market is forecast to exhibit steady growth on account of rising power demand, unreliable grid infrastructure, industrialization, commercialization and construction of large scale public infrastructure. Asia Pacific is the key revenue generating region in Global Gas Genset Market in 2015 followed by North America. Industrial segment accounting for the largest share in overall gas genset market in 2015 due to high demand from utilities, oil & gas and heavy industries for backup power. However, the growth of gas genset market mainly depends on the development of gas supply infrastructure worldwide along with the implementation of stringent emission norms to curb air pollution.